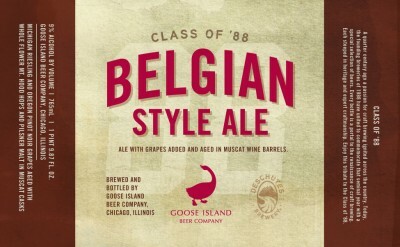 Bend, Oregon/Chicago, Illinois – Deschutes Brewery and Goose Island Beer Company, both founded in 1988, have come together to create an Belgian-style ale to celebrate their shared silver anniversary. This beer is the third and final in Deschutes Brewery’s Class of ‘88 collaboration series, which celebrates the anniversary of craft breweries around the country that were founded in 1988. This beer aged in decade-old Muscat oak barrels for nine months – completing in perfect time for a 2013 holiday release. Launch events are planned in late-December at Deschutes Brewery’s Portland, Oregon pub and Goose Island’s Clybourn pub. Stay tuned to the Deschutes Breweryevents page and Goose Island Beer Co.’s website for more information. Both beer versions will be available in each respective brewery’s distribution area for a very limited time in large format bottles and on draft. The alcohol by volume will be around 10%. Tagged: Goose Island, Deschutes Brewery, Inc.